On Sunday the cast and creatives from Star Trek: Discovery held a panel at PaleyFest Los Angeles (see our recap). While there, TrekMovie had a chance to talk to some of the Discovery crew about season two and beyond, including the new Spock, Ethan Peck. You can watch the red carpet video below the transcript highlights. Do you see this season as an arc from “The Cage” and dealing with your sister to an endpoint with Spock in the first season of TOS? Yeah sort of. I think that overshoots it. I think by a decade, because currently in the season of Discovery we are ten years before The Original Series, three years after “The Cage.” So, ultimately, yes Leonard Nimoy’s Spock is the light at the end of the tunnel, but in terms of this season, this is just the beginning of his journey to becoming the Mr. Spock we know from TOS. You did a lot of research on Leonard Nimoy – like even the way you say “sensors” – Are these conscious things for you to imbue Nimoy-ness? Yeah, definitely. He is from Boston and you can hear that a little in the way he speaks as Spock. So, I really wanted to bring that in. I don’t know where “sensors”—I don’t know where he got that from, but it is essential to him. So, I wasn’t going to overlook that. In all your research into Leonard Nimoy, what the biggest thing you picked up that has influenced your interpretation? That’s a great question. Probably how deeply empathetic he is, how deeply human he is. And also, really what amazing – so, the first book he wrote – I am Not Spock – was mostly not read or dismissed. People interpret it as him disowning the character. And it was more like in defense of Nimoy, because he had become so much like Spock and Spock had become such a big part of who he was. And to understand the closeness he had with Spock as Leonard was really amazing and speaks to the depths of to which he went with Spock. Can you talk about the instant chemistry you formed with Sonequa Martin-Green? Did you prep for that, or did it just kind of work? It just kind of worked, to be honest. I think we just have great respect for one another. We just both jumped into the sibling rivalry thing and that kind of carries on off-set. I think we just lucked out with chemistry. She was just so willing and I was. Can you say anything about the final four episodes? What I can say is that I have been a part of it. I have filmed it. I have been inside of it. And I can’t wait to see it. I think it is going to be so stupendous. Do you expect to back for the third season? With Anson Mount leaving a lot of fans are clamoring for the idea of you and Rebecca [Romijn] and Anson having a spin-off, or a Short Trek or something on the Enterprise. Is that something you would be interested in? Yeah, I think it would be pretty cool. Has there been any discussion about that? In case you missed it, we also covered Alex Kurtzman’s comments about the upcoming Picard show from PaleyFest. TrekMovie has more coverage from PaleyFest, including red carpet interviews. So stay tuned. I’m looking forward to seeing Spock’s future on Discovery and Star Trek. He should get his own show with Pike and the Enterprise before TOS and Discovery can go somewhere else in the prime timeline like the future. Ethan Peck is a great actor and he honors and respects Leonard Nimoy’s legacy as Spock. I appreciate that. Are you okay Ad Astra Aspera? Just this last one, please? Only if you’re really good this year. You’re not alone with that sentiment…. I don’t mind another Enterprise show, that name just seems to carry weight but I do like it when they expand beyond that. We know the Picard show won’t take place on an Enterprise which I’m fine with, but it would be weird we never see one show up either. I think you can compromise that way like they are doing with Discovery now. I feel that they should leave the adventures of the Enterprise to the Big Screen. Spinoff Please! Pike, Spock and Number One on the Enterprise. Make it so. It would be great. Just depends on whether CBS has the money to fund another Star Trek series and also if those 3 main actors would even want to do it. Recasting them all over again just wouldn’t work. Exactly. In my experience “I can’t talk about that” invariably translates to “There’s something to talk about”. Does it mean we’re guaranteed a Pike/Spock show? Of course not but it’s the first real indication that they are at least discussing the possibility. More likely he’ll be back in season 3. Very possible, Peck wasn’t mentioned in the report that said Mount and Romjin wouldn’t be involved. I admit my preference towards wanting an Enterprise show perhaps makes me want to read more into his comments than might actually be there. We don’t know of course and whose to say that you’re bias towards not wanting a show might make you want to read less into his comments than is actually there. For me it’s reality. They have their plate filled right now. It’s very unrealistic that they would make a show with Enterprise. For me it’s a possibility. I never consider my opinion to be a hard fact. I’d love to see that – and make it episodic and about exploration, like the original. The original wasn’t usually about exploration — there was usually a mission (we’ve lost contact with x colony, etc). He’s going to join the cast of Discovery. One of the things that I’ most hope for in a Pike’s Enterprise show or miniseries would be for it to be a true ensemble show. For many of us, the strength of Trek shows from TOS on has been the ensemble. To me, TNG and DS9 did this best. For me, serialization could work, as long as it involved long arcs about the ship’s exploration. It could be very cool to take 3-4 episodes to really dig more deeply into a new situation while giving the ensemble each their own opportunity to shine. Discovery has arguably the strongest cast ever in terms of acting. Great depth right down to the minor characters. But with the show intended to be Burnham’s story first and foremost, we’re often frustrated that we don’t see more, that the ensemble is there in service of one character’s story, and the other 3-4 long term secondary leads are getting just enough in terms of stories to meet contractual obligations. It sounds like the new Picard show will be the same. It will be some kind of recovery or restoration arc for Picard. It will be the journey of an individual and not the crew of a ship. The rest of the cast may be strong, but they will be there, and perhaps even come and go, in service of Picard’s story. Picard’s a beloved character, so it will be interesting, but in that mix of different offerings that Kurtzman’s talking about, shows that aren’t fundamentally centered on one person’s growth need to be there. The S31 show is clearly intended to be a vehicle for Michelle Yeoh…and they already appear to be writing Alan Van Sprang – – a strong actor and foil — out of the series. So I’m not expecting an ensemble there. So, Pike-era Enterprise. Already we have Pike and Spock as strong characters. Rebecca Romjin’s Number One remains to be established but she’s a strong actor. Add in a young Urhura and a few other officers and it could be the ENSEMBLE show many of us won’t be getting from any of the offerings in development. Thanks for the vote of support Corylea. You made my morning. I personally think the Enterprise season 4 approach is a good one. Have a few 3 part story arcs and add in a few stand alones. The only member of the crew from Kirk’s Enterprise I can realistically see on the show would be Montgomery Scott be on the engineering staff at some mid level. My head canon was that Scott was one of the crew already on board when Kirk showed up. He was either recently promoted to Chief engineer or Kirk did it when he came on board. Either way, he’s the one to put in there as only he and McCoy and Spock were older than Kirk. My other head canon is that Kirk had a friendship with McCoy from before he took command and brought “Bones” with him when he took over. ML31 I’m pitching Uhura because I don’t think her history is locked down. Bridge crew don’t all come aboard new with a new Captain. Yes, some officers and crew may have followed him from his previous post, but others will have come up on the Enterprise. It would be great to see Uhura being mentored by Number One…who in Trek Lit had a specialization in computer communications. It could really go with the broader arcs across the various shows. We know that IT and communications security will be an issue going forward. Given the end of holographic communications and new firewalls, there is an opportunity to see Uhura as a young officer working with Number One on a project to develop robust systems, even if some were a technological step back. Fair enough. Both are characters that I still wouldn’t really focus on. I was thinking the Chief Engineer would just occasionally say, “Mr. Scott, go check the technobable plates on unit 4 and send me a report.” Something similar could be done for Uhura, I suppose. I’m really hoping for an ensemble of 7-8 characters based on the Enterprise that get solid development plus a few solid recurring ones, as we did in the 90s series. So Pike, Spock, Number One, Doctor, Chief Engineer + helm?, comms? with young Uhura and Scott as recurring characters…. I’d be surprised if a standalone Enterprise series happens. In fact, I’d wager four quatloos against it. As a big fan of Anson Mount as Pike, I have to say nonetheless I’m not into the idea of any more pre-Kirk, pre-TOS shows. Let’s move forward, introduce new characters to the Trek universe, be original. That said, I fully expect to see the ‘backstories’ of young versions of all, or nearly all of the TOS characters, because…$ubscription$ to CBSAA. And the eventual TOS reboot. There will already be more. We know that because of the Section 31 show. He’s only saying he doesn’t want too many TOS prequels which the Pike show would be the THIRD one and all taking place in this one specific period. He’s not saying there shouldn’t be anymore 23rd century stories but I think a post TUC one (which is also in the 23rd century) would be more interesting as its one NO ONE has covered yet. We now have Discovery and Section 31 covering the pre-TOS era. To be honest we don’t need yet another show but I can understand the appeal for the Pike show obviously. But I also think thats why its not a done deal because they are conscience of that. I would honestly rather see something set in the land between TUC and TNG or post Nem. That said, I’m currently jonesing for a Pike led show because he has been so good on Discovery and Discovery has been so mediocre. I’d rather see Pike’s crew than anyone from season 1 of Discovery any day of the week. The only prequel era I am generally interested in is a post TUC era. That was actually what DIS was originally rumored to take place in. That would probably be the most exciting because its 80 years between TOS and TNG and they could do a lot of stuff like how the Klingons ultimately became allies with the Federation or even introduce the Cardassians and the eventual war with them. That should be the new slogan! I would love a pike era show big e show. Would love to see an April era and big e c era show as well. Me too. But I doubt it’ll happen. To the barber shop, I hope. I’m really loving his Spock. I’m hoping if they don’t get their own show (and I’m pretty doubtful) then they can use them on the Section 31 show. 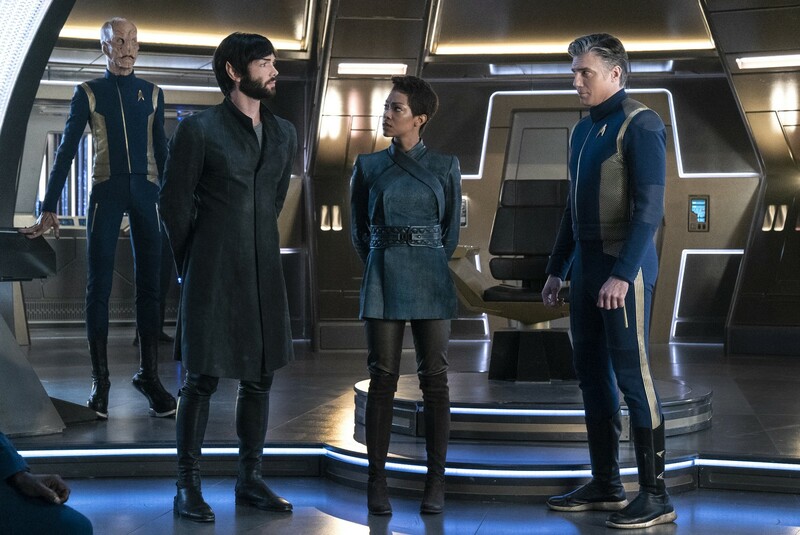 The little other stuff I read in other places with some statements about the end of Discovery second season finale might suggest why we won’t be seeing these guys next season but it doesn’t mean they can’t pop up on the Section 31 or even have a recurring role there. As you know Tiger I’m much more optimistic about the prospects of getting a Pike/Spock series. I just think the way they’ve gone about casting these iconic parts so carefully with the level of talent that can draw in a TV audience and that from the point of view of CBS, to executives that maybe only have a passing familiarity with the franchise a show that focuses on Spock and the Enterprise is an easier sell to them. I’m really glad Trekmovie put these questions to SPeck. It was obvious that if he knew anything then he would be under instruction not to talk about it. However, you can gage a lot from how somebody responds to a question and this had that feel of when Kurtzman was directly asked about the Picard series before he was ready to announce it. I think the fact that he said that he cannot talk about it implies that there is at least something to discuss otherwise why not say, I’d love to do it but nobody has spoke about it? Also I liked how he responded to the question about Spocks transition into the person we watched in TOS. He pretty much states that yes we are watching this journey unfold but he was quick to point out that TOS is 10 years away. Maybe, as usual I am reading too much into things but this almost felt like him saying that there’s much more of this story that we’re going to see beyond season 2 of Discovery. Of course this is a long way away from confirming an Enterprise based project but it does strongly suggest that they are at least talking about it. They obviously speak about a lot though so I can’t fault you for being cautious in your appraisal of the prospects of a Pike/Spock show being greenlit. We don’t know how far along these conversations have gone, whether it’s just a twinkle in somebody’s eye that might quickly be forgotten about or something they’re gearing towards announcing! I’m going to leave myself open to huge disappointment and remain optimistic but one way or another it’s starting to look increasingly likely that we’re going to see these actors in these roles again in one form or another. Some final thoughts: again I’d like to congratulate trekmovie on another great interview and for asking the questions that many of us wanted you to ask. It will be interesting to see whether or not any of the other media outlets pick up on the comments and start to scratch beneath the surface. If it happens I will be just as thrilled about it, I’m just cautious for many reasons. I was certainly cautious over the rumor of the Picard show happening (I’m still shocked it is happening lol) but that was before there was no other show announcements. And as I said I’m NOT saying it won’t happen, it simply might be years away, that’s all. But yes I agree, they are definitely talking about it so that’s a good sign. All I’m saying is if they don’t get their own show, they still have opportunities to appear in other places which I’m guessing is also being discussed. And of course they could do a mini-series or even TV movies if not a full on show. I’m looking at it from all sides and there are tons of possibilities. Either way I don’t see them just disappearing after this season. Yeah I get that dude, you’re right as well there’s no guarantees here and like you say they’ve got a full plate at the moment. I just enjoy the speculating/wishful thinking! “I Am Not Spock” is a pretty great book. It speaks well of Peck that he is partially using that as a template. It’s about time that somebody out and out asked one of these guys about an Enterprise series. Great interview Trekmovie.com. Please give us a few seasons of Pike, Spock, Number One, and the Enterprise….Please?!? I would love a five year Pike mission on the U.S.S. Enterprise with Spock and Number One. I think it’s rather poignant we’ll know how Pike ends up. Gives it something bitter sweet. The casting of Pike, Number 1 and Spock are spot on. Especially with Anson Mount who, in my opinion, has amazing screen presence as Pike. It will be a huge disservice to not capitalize on this. I keep saying and will say it again – if not a full blown series then at least a couple of feature length episodes!! Your comment about a feature length episode prompted me to think that if Paramount and CBS remerge, the adventures of Pike on the Enterprise would be a great new film series! That could make a very cool film. Yes mount is pike imo. I love his ‘I can’t say” he’s so amused. This guy is a cutie. If he wasn’t playing Spock or he can’t come back I’d make him still play one of the human guys, someone who is allowed to smile more because he has a cute smile. His reaction says it all. There will be a Pike spin-off. We all want to see a Enterprise Pike and Spock spin off series! CBS would be stupid to miss out on this one. I will subscribe for life if they do this with a quality Picard series! If the Viacom/CBS merger happens, then it’s a good bet that the movies will be Pike and the Enterprise. Seeing how ambitious Kurtzmann is don’t be surprised if DSC and Michelle Yeoh (for international appeal in Asian markets) is included as well in a bit of a team up. I mean, we’ll see this team up towards the end of the season when the Enterprise and No.1 returns but it would be cool if Pike was the central focus in a movie. If there is a movie, I suspect it will be a TV movie for CBSAA. Not one for theaters. Same. I think that would be a great route to go in too and have Pike movies if they don’t want too many starship TV shows in the same era. AA needs to focus on films too, especially since their movie library is a complete joke. TV movies are such a 70’s thing. Better send a memo to Netflix. I don’t consider Netflix to be broadcast television. Is Roma a TV movie? CBS AA on the other hand is directly linked to broadcast tv. Most streaming site are making movies now. You have any idea how many Disney+ is making before that site even debuts? It’s up to six so far and more are in development. AA is already faaaar behind in the game and their movie library is a joke. If they want to really compete it can’t with just Star Trek shows and CSI reruns. They have to do something big to compete. Yes. Roma is a TV Movie. Just like the pilot episode of Inhumans was a TV movie. Netflix has made a number of movies. TV movies don’t go the the Oscars. I REALLY have a feeling they’ve been talking about a spinoff with such positive response to all 3 characters. I’d be shocked if they haven’t already started that ball rolling for a miniseries or why not even do All Access’ first attempt at a film like what Netflix has done? Get the director who would have directed the 4th Kelvin film. Still feel like we’ll have an announcement at STLV2019 that a Pike/Enterprise project is in the pipeline. “Has there been any discussion about that? Okay, I think it’s safe to say this show will happen now. If it wasn’t the case, he could have just said “No” flat out. I’m so much looking forward to seeing an Enterprise show if it happens. But I’m sure it will. It’s a safe bet. It’s not nothing, otherwise you can say but you’re right we could still be getting excited about something that doesn’t go anywhere. I’m going to choose to get excited though! Even it was nothing, he would just say “no” not “I can’t say.” This non-negative is exciting, as I have been hoping for a Pike-Enterprise show for 20 years. It should be different from Discovery as it could be more episodic like TOS, that would be perfect. Spock should join the Discovery crew. …and throw canon out of the airlock completely, correct? Does canon give a detailed account of Spock’s starfleet history before TOS? It doesn’t. In The Menagerie Spock states that he served with Pike aboard the Enterprise for 11 years. Although the events of The Cage supposedly take place 13 years before the first season of TOS. I’m sure there are ways fans can make both things true. Then there are all the childhood accounts of Spock’s life. The only window that seems to be very blank are his Academy days and very early Starfleet duties. If Spock was sent to Discovery on loan from the Enterprise, he could technically still be serving with Pike. Plus why should they allow one line from a scifi show 50 years ago stop them from putting Spock on Discovery? Because it would render the line false. And give credence to the concept that the new show is a reboot rather than a prequel like the producers keep telling us it is. Spock lies, he also said they have never been a mutiny in Star Fleet before. Again, more evidence Discovery is a reboot. The fact that it was publicized that the Pike and Number One characters wouldn’t be returning for Discovery season 3 indicates to me that Spock could. We need to start the “I Like Pike” campaign.